Atlantic City and Trenton Shows in New Jersey Friday and Saturday! New Jersey boxing is off to a fast start with two shows scheduled this week. Friday at Bally’s Event Center, in Atlantic City with 11 bouts scheduled over Sho Box. The main event features two topsuper bantamweights in Adam “Mantequillo” Lopez, 16-0-1 (8), of San Antonio, TX, against Daniel “Baby Face Assassin” Roman, 21-2-1 (7), of Garden Grove, CA. The co-feature has Ronald Ellis, 13-0-1 (10), out of Lynn, MASS against Philly’s Christopher Brooker, 11-2 (5), in a cruiserweight bout. Two other Philly boxers on the card are Keenan Smith, 9-0 (3), returning after 14 months of inactivity. Also, top former amateur star super heavyweight Darmani “Tight” Rock, 6-0 (4) making his first fight near home. Top New Jersey prospect Leroy “Lucious” Davila, 4-0 (2), of New Brunswick is againstAnthony Taylor, 4-0 (1), of Warren, OH. Stephon “Bossman” Young, 15-0-3 (6), of Chicago, IL, is against Elton Dharry, 20-5-1 (13), of Guyana living in Brooklyn, NY. FinallyKenneth “Showstopper” Sims, Jr., 10-0 (3), of St. Louis, MO, is against Emmanuel “Renegade”, 15-1-1 (5), of San Diego, CA. In Trenton Saturday at the Sun National Bank Center, Rene Aiken of Boss Lady Promotions, and Honorable Mayor Eric Jackson returns for her second show at this facility“Bridge Wars” featuring her nephew the return of 3 division champion “Super” Zab Judah, 42-9 (29), headlines against Jorge Luis Munguia, 13-7 (5), of Hondoras. “I’m coming in at 143 and expect to go down to 140”. The co-feature has Derrick “Take it to the Bank” Webster, 21-1 (11), against Thomas Awimbono, 25-5-1 (21), of Accra, GH, for the vacant USBO super middleweight title. Trenton’s own cruiserweight Mike Hilton, 4-0 (4), returns back to this facility again. Camden’s Vidal Rivera, 4-0 (3), in the featherweight division meets James Early, 2-1 (0), of Seat Pleasant, MD. Also, on the undercard middleweight Jimmy Kelleher, 2-0 (2), of Scranton, PA, Philly’s Donald Smith, 3-0 (2), and Darin Holiday, of Philly making his debut against the grandson of “The Easton Assassin” Larry Holmes. In a female bout Carla Torres, 5-3 (0), of PR and Cleveland, OH, is featured. This will be a pro-am with boxers from NJ, NY and PA.
Jason Sosa – From a Diamond in the Rough to World Champion! 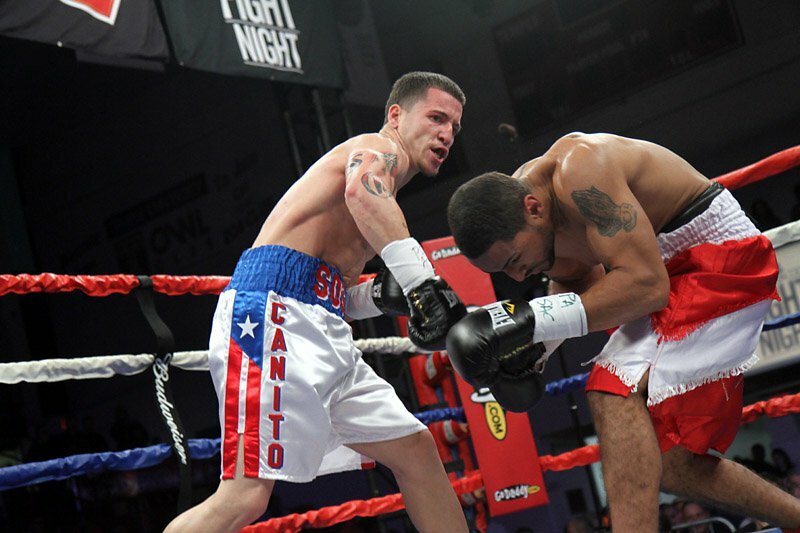 Several years ago this writer did an article on now WBA World Super Featherweight champion Jason “El Canito” Sosa, 19-1-4 (15), from Camden, NJ. He hasn’t lost a fight in 6 years and that was because he was ill advised though not at his best fighting weight to take on someone 2 weight classes higher than him. On November 12th Sosa will defend his WBA super featherweight title against Stephon “Swifty” Smith, 24-2 (14), of Liverpool, UK, in Monte Carlo. Smith re-won the vacant WBC Silver title in his last fight after losing in an IBF World super featherweight the previous month. Sosa won the title in June in China stopping previously unbeaten Javier Fortuna in 11 rounds in Beijing, China. This will be his first title defense. After his only loss Sosa won his next fight he fought a pair of draws with Philly’s Angel Ocasio, 6-0, in Philly at the National Guard Armory with both being majority draws. At Temple University’s McGonigle Hall he stopped Isaac Suarez, 7-1, and followed up in his next fight stopping CT’s own Joseph Perez, 10-1, at the Mohegan Sun Casino, Uncasville, CT. 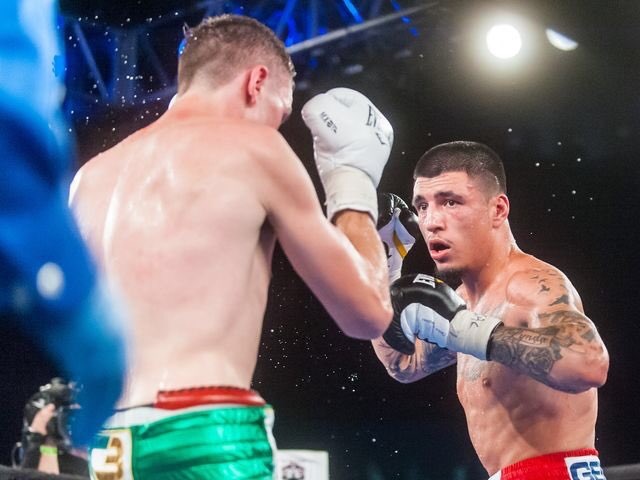 He would return to his home state of New Jersey in Atlantic City at Bally’s Event Center and stop Georgian Georgi Kevlishvili, 12-5. In April of 2014 Sosa scored a knockout over Michael Brooks, 10-1-1, at Bally’s. In March of 2015 he stopped Costa Rica’s Bergman Aguilar, 12-1-1, at Philly’s 2300 Arena. In 2015 he won 5 fights and fought a draw with former WBA Super World featherweight champion Nicholas Walters, 26-0, of Jamaica, at the Turning Stone Resort in Verona, NY. In those 5 previous wins he made his third appearance in Puerto Rico knocking out Jerry Belmontes, 19-7, who in his previous 26 fights had never been stopped. The draw with Walters earned Sosa a WBA World super featherweight title fight against Javier Fortuna, 29-0-1, in Beijing, China, where he was taking away the belt by stoppage. Sosa has surprised people in the boxing world but delighted his many fans. Take it from this writer that Sosa is one of the nicest young men you would want to meet. His trainer and manager is Raul “Chino” Rivas and they have recently signed with promoter Bob Arum’s Top Rank who partners with J Russell Peltz of Peltz Boxing who is an IBHOF promoter who went with Sosa and Rivas to China to win the title. One of the things remarkable about Sosa is he only had 3 amateur fights. He trained out of Berlin, NJ, and when the gym moved to Cherry Hill, NJ, he moved with them. He is never short of sparring partners. Also training in the gym is No. 6 WBC Philly contender Tevin “American Idol” Farmer, 23-4-1, from Philly who is the NABF champion and fighting for Peltz December 2nd. Another Philly boxer is lightweight Anthony Burgin, 10-2. In the past he sparred with both. Sampson Lewkowicz has a 3 fight option due to having the former champion Fortuna. Sosa is currently on a 16 fight winning streak. KEN HISSNER: You have come a long way since our last interview. Have the last two fights increased your confidence immensely? JASON SOSA: I believe it did by you can’t be too confident. I still have to keep proving myself and we just have more to learn. KEN HISSNER: You have had 3 fights in Puerto Rico. Did the fans make you feel at home there? JASON SOSA: Yes Puerto Rico always welcomes me home with open arms. I love Puerto Rico and they love me. KEN HISSNER: You seem to have a close relationship with your manager and trainer “Chino” Rivas. How long has he trained you? JASON SOSA: Chino and I have been together for 5 years now and he has taught me so much not only in the boxing world but as a father figure. Our relationship is like father and son. KEN HISSNER: Have you seen your next opponent Stephen Smith? JASON SOSA: Just a little for I leave that to the team so they can get me ready for Smith. I don’t do the studying on fighters. What are they going to teach me? KEN HISSNER: Would you say the Walters fight has been your toughest in your career? JASON SOSA: On the books it says so but I believe every fight just because of my amateur experience (3 fights) which I didn’t have so many. KEN HISSNER: How has your sparring been going? JASON SOSA: My preparation for Smith has been going great. My sparring partners have been great for they push me to the limit. I work with Marcelo, Julian and are the main guys that have been helping me. KEN HISSNER: You have always been very approachable. I believe this has only added to your popularity. How different has it been since winning a world title? JASON SOSA: It’s been the same only fighters are now listening to me now and looking up to me as their motivation. If this guy with only 3 amateur fights could do it so can I.
KEN HISSNER: Thank you for taking the time to answer questions. Is there anything you want to say to your many fans? JASON SOSA: Thank you Ken. On Saturday night Al Haymon’s Premier Boxing Champions (PBC) series will be televised live on ESPN from the Sun National Bank Center in Trenton, New Jersey. UFC 200 is also being broadcast on Saturday, but the loss of Jon Jones may lead to more viewers for the free PBC card. It features two prospects with future world title aspirations. 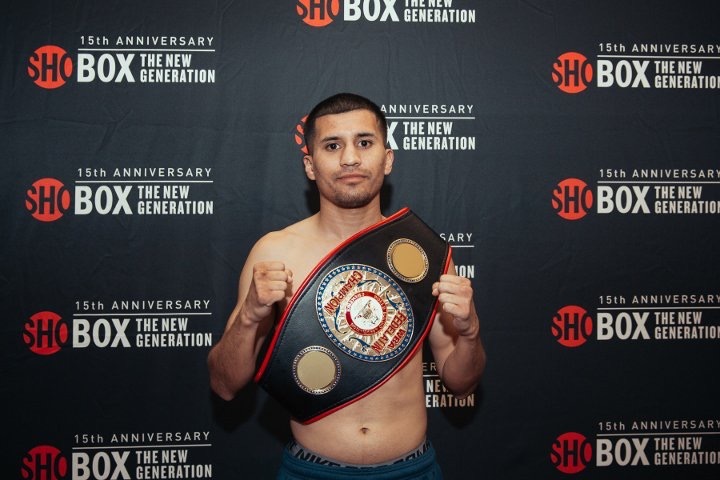 Mario Barrios will be competing against Devis Boschiero in an IBF Junior Lightweight eliminator and Eddie Ramirez will face Jessie Roman in the junior welterweight division. Eddie Ramirez has been extremely busy and fought five times in 2015 and once already in 2016. He’s a former Chicago Golden Gloves Champion and was a runner up in the National Golden Gloves Tournament the same year. His opponent, Jessie Roman, does not have the amateur accomplishments of Ramirez. He fought three times in 2015 and twice in 2014. Ramirez, at the age of twenty four, is one year younger than Roman. He will also be giving up two inches in height and two inches in reach to his opponent. However, Ramirez has nine stoppage victories in only thirteen bouts while Roman has only nine stoppage victories in twenty two professional bouts. Neither boxer has faced any serious contenders in their primes. Ramirez has defeated the likes of Osumanu Akaba, Bilal Mahasin, and former world title challenger Cristobal Cruz. Roman’s only notable victory was over Hector Serrano. Roman does not have many notable wins on his resume, but he does have two glaring losses. His two losses were to Joaquin Chavez, who had a record of 8-13-3 at the time they fought, and to Carlos Mario Sanchez, who had a record of 20-10 at the time they fought. This is a bout that Eddie Ramirez should win, easily. It will be noteworthy to see if Ramirez can stop Roman, who has never been stopped in his career. Mario Barrios has fought eight times since the start of 2015 and is one of Al Haymon’s most intriguing prospects. His activity is almost unheard of. He’s a tall fighter for the junior lightweight division and will have a six and a half inch height advantage over Boschiero. He also has a 74” reach, which is large for his division, and will have a six inch reach advantage over Boschiero. Barrios, at the age of twenty one, is also thirteen years younger than Boschiero. Barrios has eight stoppage victories on his resume, but he will have to be careful of Boschiero’s power. Boschiero has stopped twenty one of his opponents and won his last two fights by stoppage. Barrios, at this point in his career, has yet to be seriously tested. His biggest wins have come against the likes of Manuel Vides, Enrique Tinoco, and Eduardo Rivera. A lot of his wins have come against opponents with losing records. Boschiero previously fought for a world title against Takahiro Ao and lost. His other losses were to Stephen Smith and Romain Jacob, twice. He has defeated the likes of Guillaume Frenois and Ermano Fegatilli. He’s also been very active and fought four times in 2015 and once in 2016. It should be noted that Boschiero has only fought outside of Europe once, and he lost in that bout to Takahiro Ao. Boschiero has never fought in the United States. However, Barrios’ skill level and his reach and height will be too great for Boschiero to overcome and pull off an upset victory. Barrios should get some rounds in and win a decision victory.